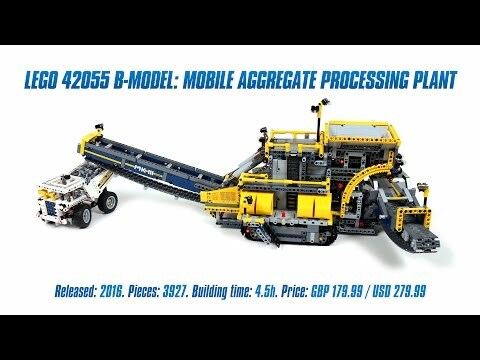 Have you built the BWE B model aggregate sorter? I have, it barely works. I wonder if I've built it incorrectly. There are no videos on YouTube yet to see how others' work. Oh dear I was really looking forward to this set but now it looks like both models have their problems. Did you buy a second set Huw or did you take the first one apart? Someone posted on the main site that they'd built it so I've contacted them to swap notes before I write anything about it. Building my own sorting machine earlier this year using ninjago blades, sortings not the easiest thing, especially when you increase the range of bricks and tiles you filter. I was thinking of building the sorter rather than the excavator first, however looking through the instructions, i'm not really sure how it sorts stuff, so I might just make the excavator and stick with my own sorting combo. @Huw do you know about how much less the part count is for the sorter? Because if it can work I may try to see if bricklinking the sorter and taking parts from my collection would be cheaper than buying the set. Obviously substituting new colors and such to make it cheaper. I believe around 75% of the parts are used in the sorter. I hope to have a review of it online later today. An excellent video review and I'm glad to see that my conclusions were verified by Pawel.